P. DeLeon and M. Sammons, Foreword. R. Kraus, J.S. Zack, and G. Stricker, Introduction. Michael Fenichel, Online Behavior, Communication, and Experience. J. Suler, The Psychology of Text Relationships. J. Grohol, Online Counseling: A Historical Perspective. M.J. Mallen, Online Counseling Research. J.S. Zack, The Technology of Online Counseling. R. Kraus, Ethical and Legal Issues in Online Counseling. R. Kraus and J.S. Zack, The Business of Online Counseling. E. Zelvin and C. Speyer, Online Counseling Skills Part I: Treatment Strategies and Skills for Conducting Counseling Online. G. Stofle and P. Chechele, Online Counseling Skills Part II: In-Session Skills. D. Bellafiore, Y. Colon, and P. Rosenberg, Online Counseling Groups. A. Barak and T. Buchanan, Internet-Based Psychological Testing and Assessment. A. Skinner and G. Latchford, International and Multicultural Issues in Online Counseling. L. Holmes and M. Ainsworth, The Future of Online Counseling. About the Contributors. Providers and consumers of mental health services are increasingly making use of the internet to gather information, consult, and participate in psychotherapy. This Handbook gives practical insight into how professionals can translate their practice to an online medium. Divided into four sections, section one provides an overview of how the internet has become an integral part of people's lives, and the research to date on the use and effectiveness of counseling online, as well as idiosyncrasies of online behavior and communication. Section two discusses the "practical" aspects of counseling online, including technological issues, ethical and legal issues, and business issues. Section three focuses on performing psychotherapy online, including online treatment strategies and skills, working with online groups, online testing and assessment, and international and multicultural issues in online counseling. The last section discusses the future of online counseling. 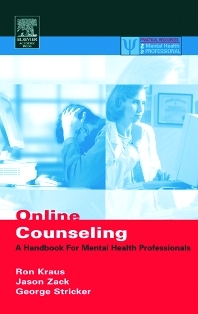 The Handbook is intended for those professionals interested in the burgeoning telehealth movement and to those practicing therapists looking for ways to expand their practices online and/or to help round out treatment to specific patients who might benefit from online therapy in addition to traditional delivery. Dr. Stricker is a distinguished research professor in the Derner Institute and Adelphi University. He received a Ph.D. in Clinical Psychology at the University of Rochester in 1960. He has been at Adelphi University since 1963, and served as Dean of the Derner Institute for a decade. Dr. Stricker is a Diplomate in Clinical Psychology and was elected as a Distinguished Practitioner in Psychology. He received the American Psychological Association Award for Distinguished Contribution to Applied Psychology in 1990, the American Psychological Association Award for Distinguished Career Contributions to Education and Training in Psychology in 1995, and an honorary Psy.D. from the Illinois School of Professional Psychology, Meadows Campus, in 1997. He also recieved the National Council of Schools and Programs of Professional Psychology Award for Distinguished Contribution to Education and Professional Psychology in 1998, and the Allen V. Williams, Jr. Memorial Award from the New York State Psychological Association in 1999. He received the Karl Heiser Award for Advocacy in 1996 from the American Psychological Association. Dr. Stricker has been President of the Division of Clinical Psychology of the American Psychological Association, the Society for Personality Assessment, the New York State Psychological Association, and the National Council of Schools of Professional Psychology. He is on the Board of Directors of the Council for the National Register of Health Care Providers, and has served on several APA Boards and Committees, including the Board of Educational Affairs and as Chair of the Ethics Committee. Dr. Stricker is both author and editor. He has worked on about 20 books, 30 book chapters, and more than 100 journal articles. His principal interests are psychotherapy integration, clinical training, ethics, and research in grandparenting. Dr. Jason Zack is a consulting psychologist and Adjunct Assistant Professor in the Department of Education & Psychological Studies at the University of Miami (Coral Gables, Florida, USA). He is President-Elect of the International Society for Mental Health Online and was formerly Director of Research and Development for eTherapy.com. An expert in psychotherapy research and technopsychology, Dr. Zack currently consults with a variety of organizations (in the US, Japan, and elsewhere) to develop new, technology-driven modes of mental health service delivery. In May, 2000 Dr. Zack received his Doctoral degree in Counseling Psychology from the University of Maryland, College Park, the nation’s top-rated Counseling Psychology program (US News & World Report), where he was a Doctoral Research Fellow. He received his Bachelor of Science degree in Psychology with Highest Honors from the University of Florida in 1995 and his Master of Arts degree in Psychology from the University of Maryland, College Park in 1997. While at the University of Maryland, Dr. Zack worked closely with Clara E. Hill, Ph.D., one of the world’s top psychotherapy researchers, past-president of the International Society for Psychotherapy Research, and editor of the Journal of Counseling Psychology. Dr. Zack has published numerous research articles in respected peer review journals, primarily in the areas of psychotherapy research and career assessment. Dr. Zack has won several research awards and has been invited to present at conferences across the United States, and abroad. Trained as a scientist-practitioner, Dr. Zack is an experienced psychotherapist as well as a researcher, and embodies the goal of merging clinical services with the scientific technological frontier.